Note: There are some needless modifications suggested to the EBS-1 system on the Internet. The unnecessary modifications result from someone running extensive tests, but unfortunately running baseband audio frequencies directly into the EBS system. The EBS system is designed to work from RF, not audio frequencies! It will not work properly when audio frequency signals are applied directly to the input port. If your amplifier is working properly and does not have a defective component in the EBS system, it will work fine without modification. The normal turn-on point in an AL80B is about 0 dBm, or 1 milliwatt, on 160 meters. There are details explaining this below. 2.) If threshold is higher than -35 dB peak drive power, and does not have a hang time, you can be sure the auto bias has the potential to change envelope waveform. 3.) All amplifiers with auto-bias should be tested before operation, and periodically after being placed in service, for low-level signal operation on all bands. This test has to be made at radio frequencies, an audio or function generator into the RF detector will NOT work. Before modifications or servicing, EBS systems should be tested for proper threshold voltage. The testing is very simple. 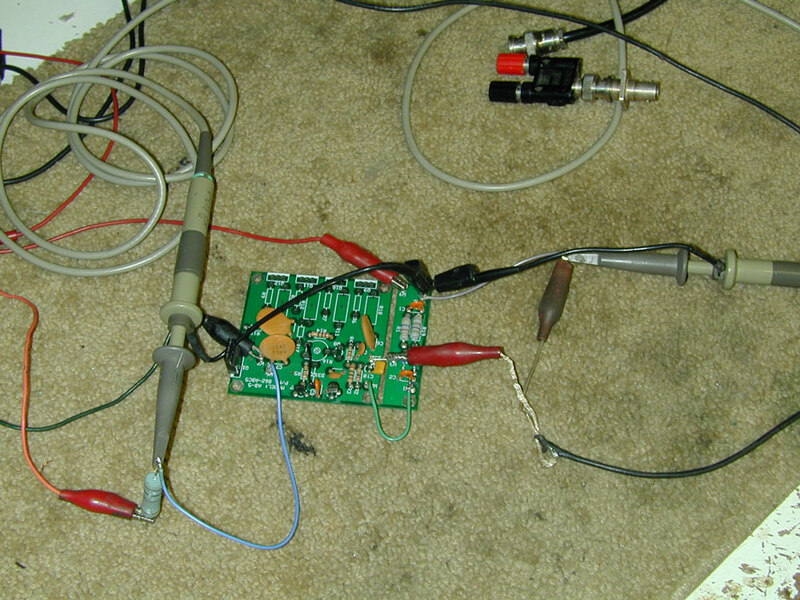 Testing does not even require e removing the amplifier cover. The idea behind automatic electronic bias is a reduction of quiescent current and heat in high power radio-frequency amplifiers. The basic idea is when RF drops to a very low level, large amounts of quiescent current are not necessary. A proper auto-bias reduces quiescent current under low-level conditions, but never takes the plate current to zero or grid bias to or beyond cutoff. This reduces heat and can save a significant amount of wasted energy. The bias system must never go deep class C, and must never force cutoff bias to needlessly high levels. Resting bias must hover at or around tube cut-off voltage. The bias system must respond rapidly, even with very little radio frequency input voltage. Linear operating bias must be switched on faster than syllabic or CW envelope rise. There must be adequate hang or turn-off delay at the falling edge of exciter RF output. This requires a fast attack system with long hang time. The bias system has to switch on with drive levels far below levels where high PA current is required. This is to minimize turn-on clipping. The bias voltage, when switched on by higher RF levels, has to be stable. This will minimize intermodulation products. Automatic or dynamic electronic bias systems work extremely well, so long as conditions above are met. On the other hand, many auto bias systems create needless problems. The general rule is if you can hear truncating of background noise or leading edges, the system is causing some level of wideband spurious. Designs can improve when we look at, and correct, past mistakes. The old Alpha 77 EBS system has major problems. The Alpha 77 design forces the 8877 tubes hard into cutoff. +20 volts cathode bias would have been adequate, but the ETO system forces bias well above that level. Under no-signal conditions the excessive bias pushes the tube(s) deep into class C, instead of properly being at the edge of class B. With grossly excessive cutoff bias voltage, the Alpha 77 has to pull the bias down from an unnecessarily high cut-off voltage (near 100 volts) to a few volts. When the bias starts out much higher than necessary, any electronic dynamic bias requires significantly more time to pull out of cutoff and become linear. Worse yet, very low level signals are either not passed, or are passed through a class-C system. This causes chopping and distortion (RF signal gating) at the start of each RF syllable. This insures very low level signals are not amplified, at least for a short period of time. Excessive time delay in reaching linear operating truncates and squares the envelope's rising edge, and causes extremely wide bandwidth leading edge clicks on SSB and wide leading edge keyclicks on CW. A properly designed electronic or automatic amplifier bias system would have the tube(s) hang at very slight conduction current. A very small level of quiescent current keeps the tube(s) into AB class at all times, even though it would be very deep AB class (at the very edge of class B). With minimal quiescent current, resting dissipation is virtually the same as full cutoff. While maintaining deep class AB, nearly all RF idling heat would be generated by the tube filament. It's a good idea to have a self-bias resistance shunting the electronic switch in any EBS system. A shunt self-bias resistance could be designed to hold the PA system slightly in conduction with a minimal amount of quiescent current. A 2-5k ohm resistance should be good enough for most high-mu triodes. You might want to read about cathode bias at this link. Some Chinese tubes, in particular 811 and 572 tubes, require some forced bias. I believe this is because grid end construction allows electron leakage to the antenna, causing them to act like remote cutoff bias tubes. This is abnormal behavior. It is not found in older European and USA 711 and 572 tubes, or in all batches of Chinese tubes. In the circuit below, C2 serves only to couple the 1.8-30 MHz transmitter energy into a standard diode voltage doubler. In order to properly double, the system needs a dc path from the R6 side of C2 to ground. R1 limits diode and Q1 base current. C5 is an RF smoothing filter. R2 loads the base of switch Q1. Q1 has a 1.4 volt threshold, although a standard bipolar would switch lower. Q2 is a switch that turns on when the base goes below resting bias voltage. It follows bias voltage down until D3 eventually clamps at around 9 volts. D3 will set the "on" bias voltage. R8 limits diode current in tube arcs. D4 clamps the open circuit to a reasonable voltage, and can normally be omitted if triodes or tubes are actually used in place of R99 (see what happens in the cathode at the cathode bias link up above). C6 adds a little hang time. R5 limits discharge current of C6 while C6 recharges to an "off" state through R4. C3 is just an RF and transient bypass. There is a great deal of additional external capacitance not shown. I sent this private email hoping to start a constructive dialog. . . Your model is all messed up! The analysis is meaningless because you applied audio frequencies to the input instead of radio frequencies. The lowest possible frequency on the input is 1.8 MHz, not 10 Hz or even 3,000 Hz. Why would anyone model an RF detector with audio frequencies applied? "His statements took me back a bit. One should know that a "modulation" envelope is what SSB produces (not a 'carrier'), so in the limit (using math jargon), a 50hz 'tone' modulating the SSB Tx at some RF frequency is one example. Since low frequencies (50hz) are easily produced in the newer radios (FT-2000, FT-9000, etc) the problem centers on the inability of most EBS ckts to pass these low frequencies @ low level b/c of two (2) main factors: improper time constant (too short) and input passband skew (shifted toward high frequencies)." The above response to my e-mail highlights a misconception that I've seen several times over the years. It appears some think audio frequencies appear at a transmitter's antenna connector. Some apparently think audio baseband frequencies appear at a transceiver's RF output connector, and are processed through the amplifier system and antenna as baseband audio. I've even, on rare occasions, heard Hi-fi audio (ESSB) people describe how a push-pull RF amplifier has less RF intermodulation or splatter, which is also just as silly! It's easy to understand this confusion, and it's generally easy to straighten out the misconception with most people. A SSB transmitter is really a frequency convertor. It ideally converts audio to a similar bandwidth RF signal through various methods. If any HF SSB transmitter is modulated with a single tone, such as a 50 Hz tone, the transmitter output actually contains no 50 Hz energy at all! Let's look at why this happens. Let's consider a SSB transceiver tuned to 3.800 MHz . When the suppressed "carrier" frequency is set at 3.800 MHz and we apply a steady 50 Hz tone to the balanced modulator or digital equivalent of the balanced modulator, the RF output frequency is actually a pure radio frequency sine wave at 3,799,950 Hz. The radio is actually a complex frequency convertor, converting audio signals up to a selected radio frequency. The spectrum is either inverted on LSB with higher pitched tones becoming lower RF frequencies, or non-inverted on USB with higher tones producing higher RF frequencies. This "conversion process" is why a 50 Hz tone passes right through antenna tuners, coax, and eventually radiates from a 3.8 MHz dipole! This is why we do not need 50 Hz coupling capacitors in RF systems, even when the baseband audio signal is just a few Hertz. If the 50 Hz signal, or some other low signal frequency, actually appeared and required transmission, our 130-foot long 80-meter dipoles would be far too short! At the receiver the "TONE" goes through a series of bandpass filters, none of which need to respond to 50 Hz! Why? Because the tone is converted to radio frequencies by the transmitter! Obviously, there is no need for the EBS or any electronic bias system to respond to 50 Hz at the RF detector. 50 Hz is clearly not present at the amplifier RF input or at the cathode of the tube, or anywhere in the system beyond the balanced modulator and prior to combining with a local carrier oscillator! In the receiver the RF tone is converted to new frequencies, eventually reaching a final "mixer", or product detector, that reinserts a local carrier oscillator. This creates a new "difference frequency" on the proper sideband, and passes the newly generated difference frequency out to the audio stages. It is at this point, and this point only, the 50 Hz energy finally reappears. As a matter of fact if you mistune the receiver slightly we never get the original 50 Hz in this example, we get some other entirely different audio frequency. The single tone RF output, regardless of audio tone input frequency, is a single narrow RF spike that actually is a steady unmodulated RF carrier! Years ago Collins and other companies generated CW this way, by using a 1000 Hz tone injected into the audio of a SSB exciter or transceiver. The output frequency of any SSB transmitter is indeed a single RF frequency when modulated by a tone. This radio frequency tone, or plurality of radio frequency tones (for speech or two-tone tests) far above the baseband audio frequency range, is actually what the electronic bias system detects. Note there is no energy in the modulation at 50 Hz!! It is all on 75 meters (in this example) as it should be. Note voltage source V1 is a 8-volt peak-to-peak RF (2.828 volts RMS) generator. It feeds a 50 ohm load. The power is .16 watts, or 160 milliwatts. For a two-tone source, typical of speech, we would need to simulate the actual RF signal. Say we had a tone of 50 Hz and 2500 Hz. The 3.800 MHz LSB transmitter would now output two frequencies, 3.799,950 MHz for the 50 Hz tone, and 3.797,500 MHz for the 2500 Hz LSB tone. The resulting drive waveform looks amazing like a two-tone test instead of a carrier, because it is a two-tone signal! The waveforms and circuit shows none of the problems caused by using the incorrect simulation of audio frequencies to represent a radio frequency signal. When the bias signal switches on, which actually occurs in about .17 milliseconds on the initial leading edge, bias stabilizes and sits at about 9 volts. This is significantly faster than the rise time of a CW signal (normally 5 ms) and so causes very little distortion to the applied waveform. Only the very first cycle in a series of cycles is modified. This model says the EBS-1 (very similar circuit, not exact) should "turn on" at about 2 volts peak. Let's see what happens below with a "real one". Enough of spice models, let's look at how an EBS-1 really works. Source voltage is a 35-volt power supply. Dropping resistor is 150 ohms, 7 watts. This is the audio test where audio frequencies were applied. For RF, the coaxial line with BNC connector is attached. Audio lines go into a low power 3.8 MHz SSB exciter. 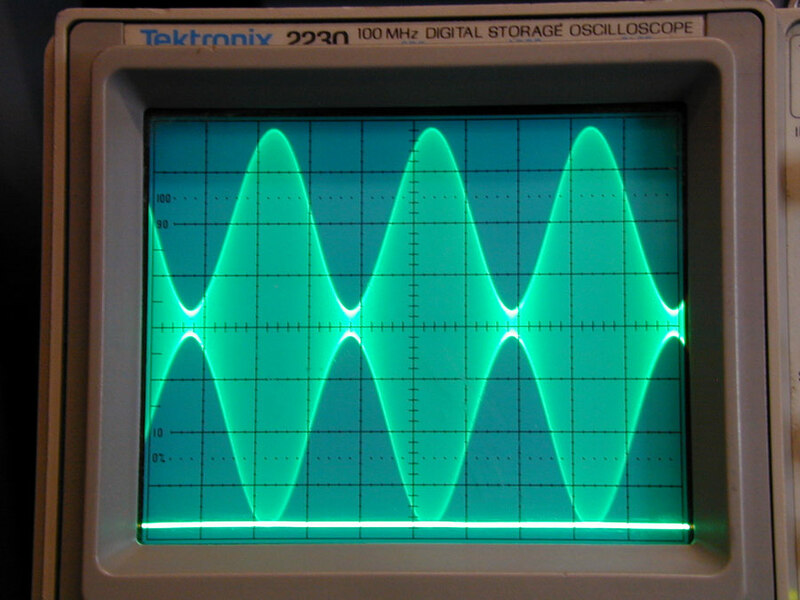 Below: Threshold of the EBS-1 is 10 volts peak-to-peak at 50 Hz. There are 3 volts of 50 Hz ripple on the bias line! This would be no good! The scope has 10x probes. 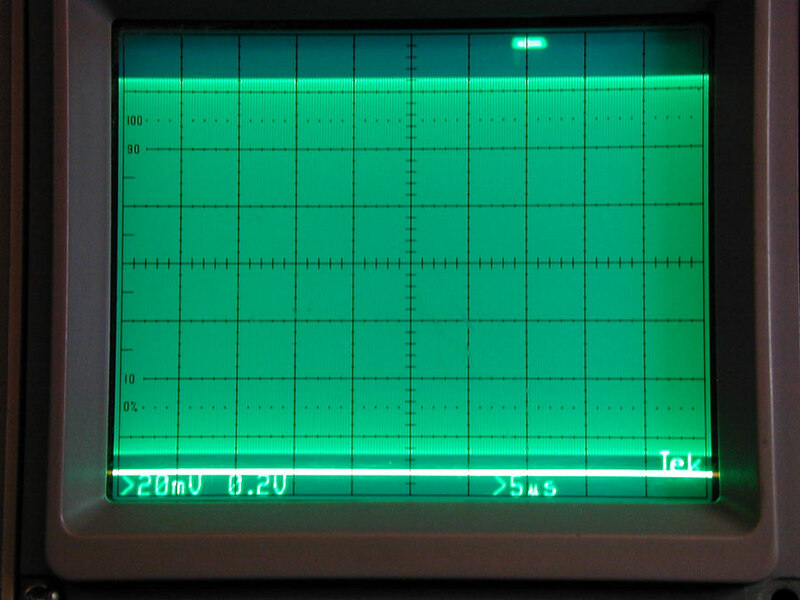 In this case with audio improperly applied to the RF port of the EBS system, we see a saw-tooth waveform with about 7 volts p-p ripple in the bias line. The applied audio level is 5.8 volts peak, or 11.6 volts peak-to-peak, and the EBS has not turned fully on. This is why the EBS, with stock component values, cannot be connected to the microphone or audio lines of a transceiver. It must be connected to the RF input of the amplifier, and it must be tested and evaluated with the RF signals it was designed to operates with. The problem with the test above is every HF radio we use does not apply audio to the EBS-1 detector. The radio applies RF! Scope has 10x probes. Multiply scale by ten. Scope is now set at 20 mV/div for RF trace with zero at very lowest scope graticule, and .2V/div for RF trace with zero at the center graticule. This makes bias range 16 volts full scale, and RF range .8 volts full scale both + and - the zero center. 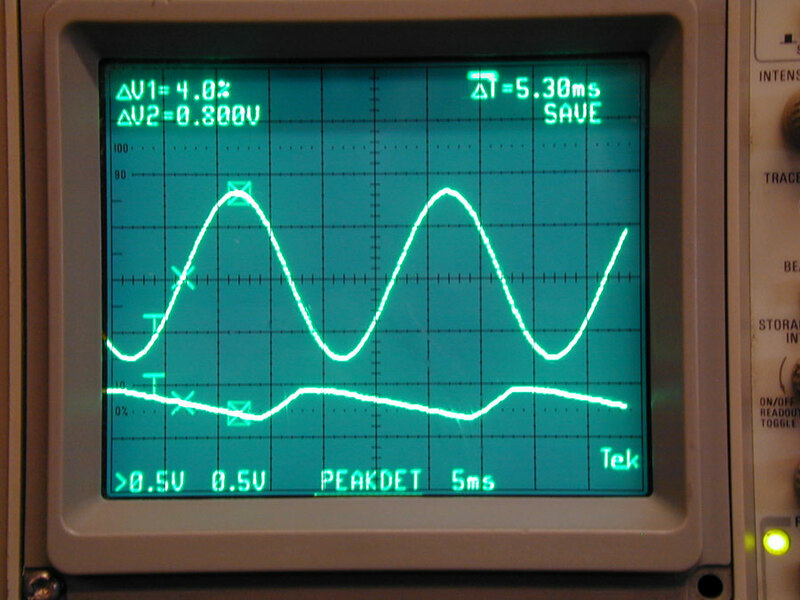 Bias is about 15 volts (upper bright line) with .6 volts peak RF, or 1.2 V p-p RF (.0036 watts into 50 ohms). This is bias HIGH (PA biased just beyond class B) at 5.5 dBm , or 3.6 mW of RF. 3.6 milliwatts is not much drive power, but turn on at such low levels is required for click-free CW operation of auto-bias systems! Now we are just barely above .6 volts peak, probably right around .64 volts. This is about 4.1 milliwatts into 50 ohms. At this point the bias is clamped low for full anode current. With just a .5 mW change, the EBS-1 went from standby bias mode to linear amplification mode. This is the bias system voltage with the RF envelope below the turn-on threshold. In this case the transmitter power would be .33 volts peak, or 1.08 milliwatts PEP into 50 ohms. The scope is at .1V/div, with 10x probes. Bias is at 35 volts. This very slight increase in drive to 1.30 mW PEP pulls the bias solidly low, and holds it there through a two-tone 50 Hz and 2500 Hz audio into the transmitter. This slight apparent increase in drive level is actually caused by most of the envelope being below turn-on threshold, not by an actual increase in required switch level. There is a fractional millisecond time delay for any waveform, with a constant maximum threshold of about 5.0 mW at 50 ohms. The EBS actually is not trying to turn on until the dotted scope lines are reached. In the previous trace where bias stays high, there just is not enough envelope time above level threshold to activate. The following shows frequency response of an unmodified EBS-1 board. The total turn on delay time from full bias to full clamp (minimum bias) is 0.65 ms with a 20 dBm (100 mW) pulsed 3.8 MHz signal. This means if we drove an amplifier with marginal signal levels that were above turn-on threshold, the actual bias delay time to stable bias would be 0.65 ms. The actual bias scale in the photo is 1 volt per division. Zero is set at the white bar at the left, just above the third graticule down from the top. Low bias voltage is about 1 volt @ 500 mA. 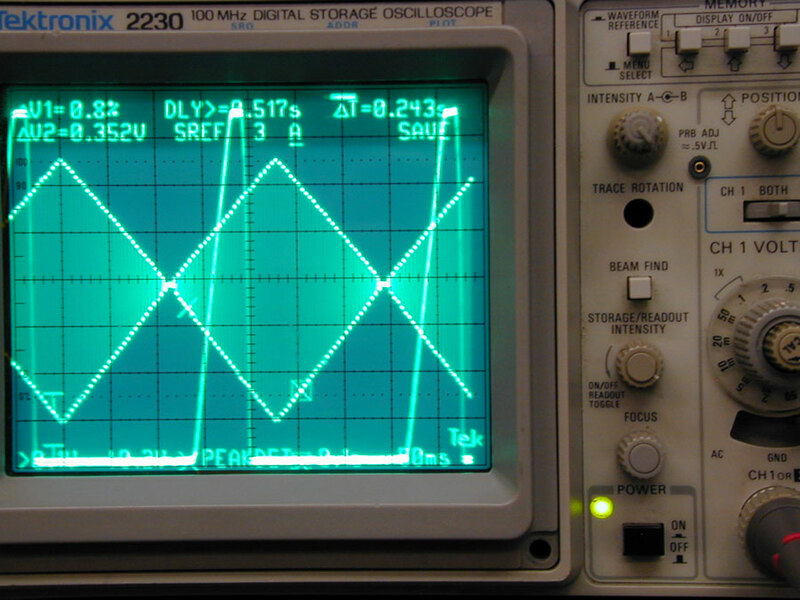 Highest bias voltage reached with this 50 Hz square wave is about 2 volts, still well within the linear region of any amplifier tube. Cut-off bias does not fully recover between 50 Hz "pulses" in this photo, so the amplifier bias remains almost as if it was never switched off. All of this is important for click-free CW operation with auto bias. 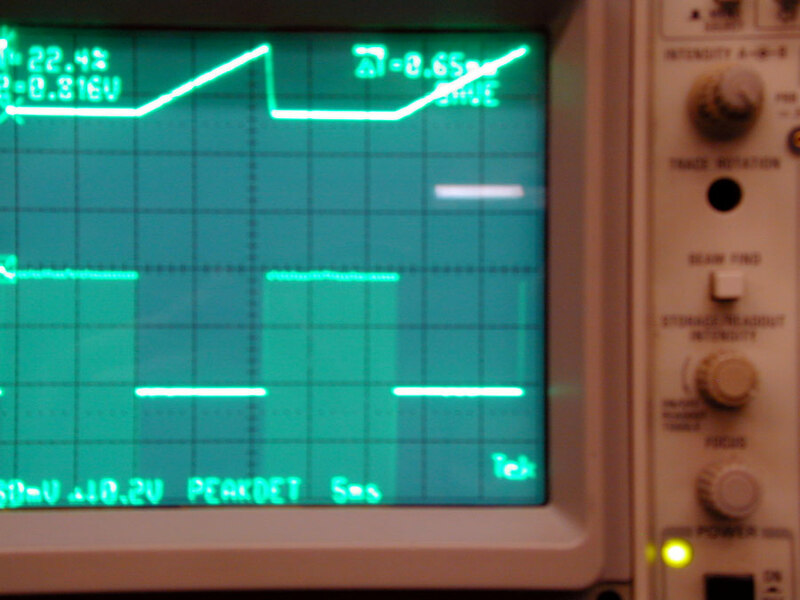 This test shows the threshold under a very slowly rising modulation envelope waveform. This is a 2 Hz modulation envelope at 200 mW PEP on 3.8 MHz.. Sweep is 100 mS per division. The EBS-1 goes from full bias to zero bias at about 5.0 mW. It recovers to full bias in about 2-1/4 divisions, or 1/4 second. This is the on-bias "hang time". The response is .5 mS on delay, with 250 millisecond off delay (hang) time. Turn-on threshold is about 6.5 mW. The EBS-1, contrary to incorrect spice models on one website, works just fine. 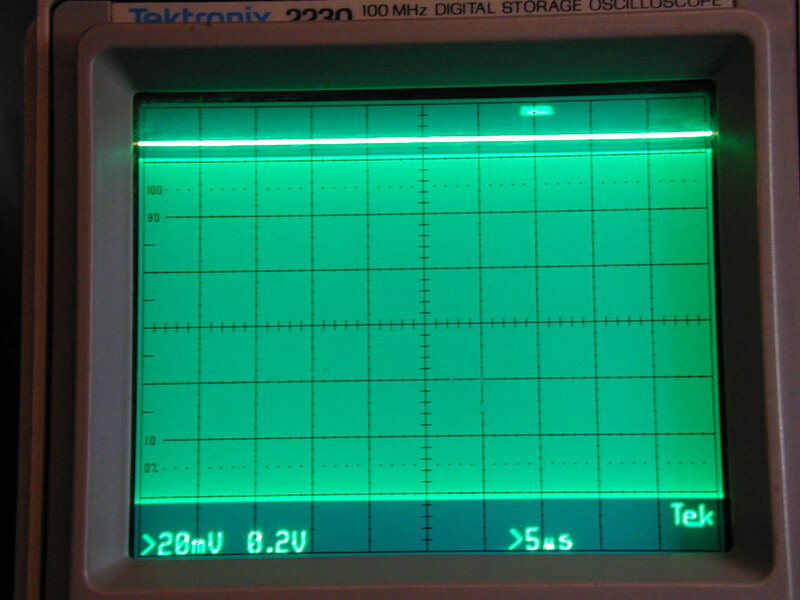 Any single tone RF signal over 5.0 mW (1.24V peak-to-peak) into 50 ohms on 3.8 MHz turns the EBS-1 on. Even a pure 50 Hz tone driving the radio will activate the EBS at that time and level! Any multi-tone signal over 10.0 mW peak also turns on and solidly clamps the bias low. Bias stays in transmit mode even during modulation minimums, where power virtually reaches zero. This is because the EBS system has fast attack response with a slight hang time. Early in EBS1 production, I made a mistake. I derived the EBS switching voltage from the RF Input port side of the input pi-network. This caused a problem on some bands on some frequencies, most notably on ten meters. This is because the input network, with an "open circuit load" caused by the tube being biased into cutoff, loaded the exciter drive down. This raised the switch on voltage to several volts, instead of the desired 1-2 volts. The cure for this problem was to relocate the EBS RF sample point after the input circuit, on the tube side of the input system. Early production amplifiers may have the EBS RF sample taken from the RF input side of the input network, and this early system can cause problems on some bands with some exciters. After testing in a few amplifiers, I've recommended Ameritron add a 2.2 K 2-watt metal film resistor across the switching transistor. This is to improve slower speed CW signal response through the EBS system. This keeps the tube very slightly into conduction so slower CW speeds through slow rise time transmitters are amplified without leading edge truncating and sharpening of the dot or dash elements. It isn't a good idea to remove the first .5 ms of the leading edge of every element. This does not affect sound on SSB, it does not affect cooling of the PA tube. For now, I'd appreciate any technical feedback on this article to my e-mail address. I do not always respond because of time restraints and the number of emails I get, but I do read everything sent from other Hams.